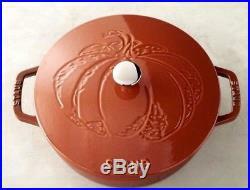 Brand New NO Box STAUB France Cast Iron French Oven 3.75 Quart Burnt Orange Round. Offering the depth of a sauté pan and the curved sides of a skillet, this essential pan is a kitchen mainstay and a symbol of French culinary heritage. Made of beautifully enameled cast iron, its domed Chistera lid is designed to promote continuous basting for succulent results. The lid's embossed exterior features a decorative pumpkin and nickel-plated brass knob. Use this versatile oven for slow-cooking seasonal stews, pot roasts and braises. Heavyweight enameled cast iron transfers and retains heat evenly. Innovative domed Chistera lid promotes self-basting and is adorned with a decorative pumpkin and nickel-plated brass knob. Multicoat enameling creates a glossy, vibrantly colored "majolique" finish that resembles fine ceramics. Resistant to rust, chipping and cracking, the coating requires no additional seasoning like some other cast-iron pieces. 4 3/4" high (6 1/2" high with lid). Specially formulated black matte interior enamel of each piece contains traces of quartz, giving it additional heat resistance and a rougher surface resulting in better browning. Smooth enameled base is compatible with all cooktops, including induction. Extra-heavy lid seals in moisture for tender, flavorful results. 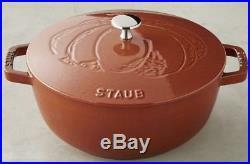 The item "STAUB France Cast Iron French Oven 3.75 Quart Pumpkin Burnt Orange Round NEW" is in sale since Tuesday, December 19, 2017. This item is in the category "Home & Garden\Kitchen, Dining & Bar\Cookware". The seller is "bknoutlet" and is located in Manorville, New York. This item can be shipped to United States, Canada, United Kingdom, Denmark, Romania, Slovakia, Bulgaria, Czech republic, Finland, Hungary, Latvia, Lithuania, Malta, Estonia, Australia, Greece, Portugal, Cyprus, Slovenia, Japan, Sweden, South Korea, Indonesia, Taiwan, Thailand, Belgium, France, Hong Kong, Ireland, Netherlands, Poland, Spain, Italy, Germany, Austria, Russian federation, Israel, Mexico, New Zealand, Philippines, Singapore, Switzerland, Norway, Saudi arabia, Ukraine, United arab emirates, Qatar, Kuwait, Bahrain, Croatia, Malaysia, Brazil, Chile, Colombia, Costa rica, Dominican republic, Panama, Trinidad and tobago, Guatemala, El salvador, Honduras, Jamaica.